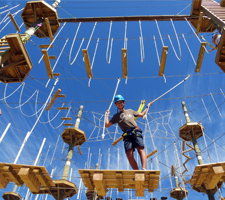 Rise and Climb Adventure Course is an aerial adventure park also known as a high ropes course. Our course is designed to stretch you emotionally and physically. 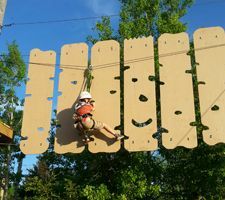 You'll have a blast experiencing the great outdoors while completing fun challenges suspended upwards of 40 feet off the ground. High Rope Course are great for groups of all sizes. They're well suited for conventions, staff outings, office parties, corporate bonding and after work get togethers. They build team unity, foster cooperation, leadership and are a lot of fun. 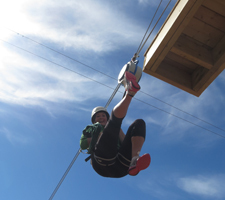 High ropes courses are very safe provided you use them as trained and directed. Participants at Rise and Climb are fitted with a standard climbing harnesses, helmet and a two carabiner lanyard system. Our staff provide mandatory training on how to use the gear properly and participants must complete a low ground training course before moving onto the main course. Our guides will always be close by if you need advice or assistance. We are located at the Terry Fox Sports Complex in Cornwall, PEI. The adventure contains more than 50 challenges to enjoy and takes approximately 2.5 hours to complete. You can sign up for any of our packages but can always upgrade once you get going. At Rise and Climb we have something exciting for the whole family. 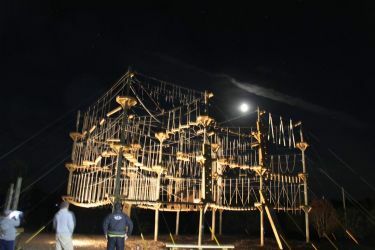 The Big Adventure Course is our flag ship with 3 levels and 50 elements stretching 40 feet above the ground. We also have a Kid's Adventure Course tailored for youth 6-12 years of age. Our new 600 foot long Tandem Zip Lines will get your heart racing and Outdoor Laser Tag is our twin attraction at our same location. It adds a whole new dimension of fun.